The focus has been on Washington, but this is what went down in NYC last Monday night—again, following the same vigil a year ago by the Veterans for Peace. NYC cops are known as some of the most corrupt thanks to their tyrannical leader and city officials who have been bought and paid for by the Illuminati. The media won’t cover it because they are paid for too. I am so proud of Americans for PEACEFULLY standing up for their rights, opposing atrocities and taking their power back. This is just the beginning. Monday night a group of veterans gathered to honor the fallen. They were taken away in handcuffs. The charge? They were violating a 10PM curfew, and thus trespassing. There was no violence. They were respectful to NYPD officers, and they were peaceful. They were there to honor the fallen and commemorate the 12th anniversary of the war in Afghanistan. 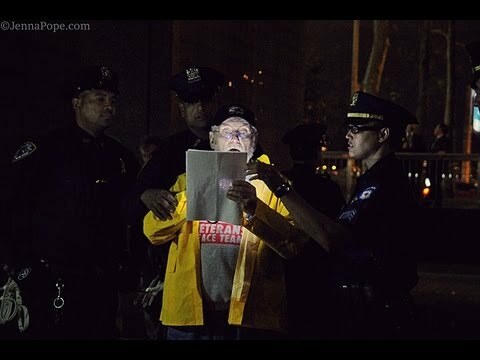 Veterans of the Vietnam War were arrested earlier tonight at the New York City memorial after staying on the premises past the curfew time of 10 p.m. Police gave multiple warnings as veterans continued to read from a list of names. Video from the event shows that not only veterans were loaded into the paddy wagon, but also younger participants in the vigil as well. In a moment you’ll see a video that is one of the most inspiring displays of American Patriotism I have witnessed in a long time. It was not just Vietnam Vets that were arrested Monday night. There were younger vets from Iraq and Afghanistan. One gentleman in the video is a proud veteran of World War II. There were some simply there to support those who have served. America, this is not acceptable in any way, shape or form. The constitution makes no provisions for curfews. Beyond that we continually allow a mistreatment of those who have put their very lives on the line for you and me. This is not the NYPD that made us proud after September 11, 2001. This is a police state situation where officers are denying their own oaths and following orders that are in direct violation of the constitution. I will not sugar coat this. I would have had a hard time remaining as respectful and peaceful as these fine men and women. If you violate the constitution, you are the criminal, even if you hide behind a badge. There was no reason to arrest people at a peaceful vigil who were simply calling upon their First Amendment rights. These veterans deserve to be honored just as they chose to be “the voice of the voiceless” on Monday night. These heroes were not always told the truth about why the government wanted them to fight. But they all fought in their hearts for you and I. 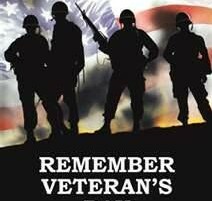 We owe these men and women. If our government will not stick up for American Heroes than we must and we will. There is a storm brewing and there will soon be hell to pay for those who trample upon the rights of Patriotic Americans. We can no longer look the other way. We can no longer turn the other cheek. We are no longer slaves to those who are elected to be our servants. We are the Patriots of America. We are the past and we are the future. We will no longer comply. To all of those who have forgotten that they work for us… Your time is almost done.